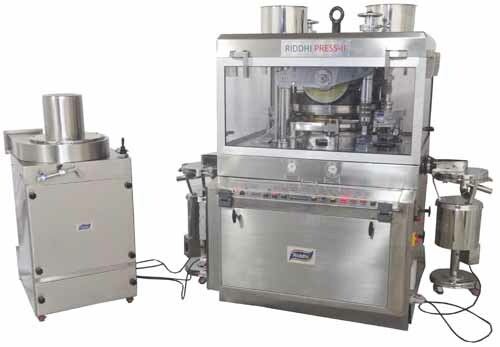 Riddhi Press Mark II is a high speed Rotary tablet press for higher table output, suitable for large batch production. Machine is also having A.C. variable frequency drive for force feeding motors, which enables operators to synchronize machine’s speed & feed both. The machine is having one piece turret of special grade casting. However, three piece turret with SS-304/SS-316 middle plate is also available (optionally). Electro less nickel plating can also be available to the turret, (optionally). The machine is having sturdy Alluminum section framed, Acyrlic guards with SS Hinges & Handle & are also fitted with Gas Filled – Shock absorbers. The machine having Hydraulic accumulator cylinder which controls two other Hydraulic cylinders connected to Lower roll carries. A Power pack can also be provided (Optionally). The machine is having excellent paint, inside wherever it is required. The machine has been designed as to minimize the change over time. The weight adjustment section is easily removable which provides good access for the removal/replacement of lower punches & dies, away from compression zone. The hand wheel is conveniently located for indexing the turret during tool change over with single operator. The machine is having specially designed Dust Extractor Nozzle which can be connected with the dust Extractor, away from machine. The machine is having Elegant Look & operator friendly design and is manufactured in such a manner that it gives all satisfaction to the operator while the production. The machine are backed by excellent after self service. Main Motor 6 HP/ 1440 RPM / 3 PHASE / A.C.
Force Feeder Motor 0.25 HP/2800 RPM/ 3 PHASE / A.C.
Total Power 9.5 HP / 3 PHASE / A.C. Overall Dimensions 148 x 141 x 188(H)(Cms.) Approx.